With all of the craze recently surrounding no-carb cloud bread I decided it was time to see if there were any other types of healthy breads that I could create. It would be difficult to top the success of cloud bread but why not give it a try. Even if I came up short that wouldn’t be so bad. So I set out to create a recipe that was gluten-free, paleo friendly, low-carb, and most importantly tasty. Most of the products out there that fit this description taste a bit like you’re eating cardboard so I was not anticipating such great results. Here are the ingredients and instructions for the bread that I created. Keto Low-carb Paleo friendly bread. And this recipe only needs 3 ingredients. Notice there are only 3 main ingredients. I did however add extra Spices and herbs, which are practically free food anyway. They do not really count toward the ingredient list and are optional. But they enhance the flavor and I highly recommend spices and herbs. The more the tastier the bread will be. So firstly this bread is paleo friendly, uses all natural ingredients, secondly this bread is gluten free and another huge thing it’s a low-carb. 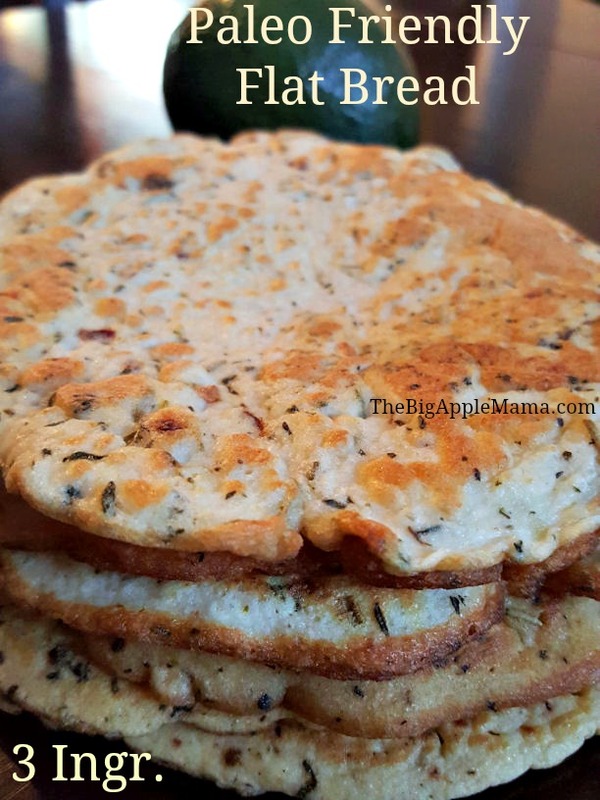 This flat bread is ridiculously easy to put together and it will be ready in 5 minutes! 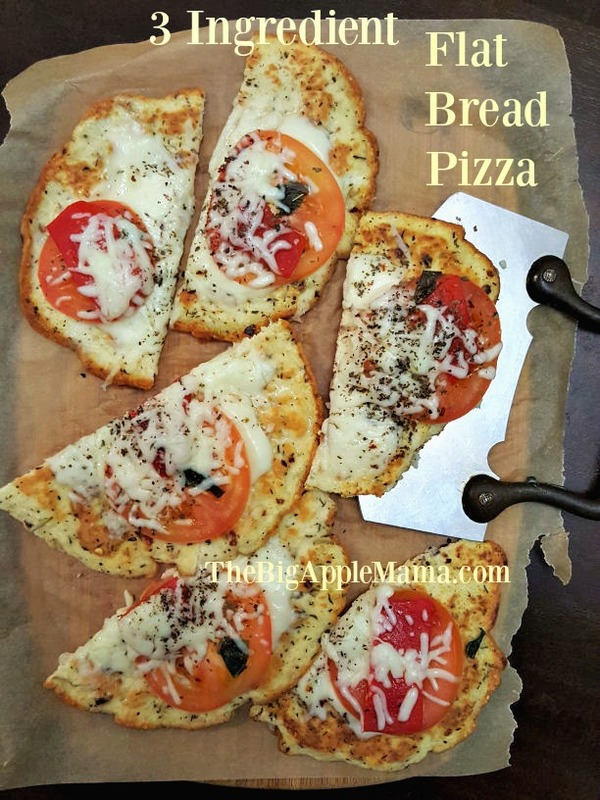 One of my most favorite things is this flat bread can REALLY hold toppings together and can be consumed in different ways. My favorite way to enjoy my flat bread is to put this very yummy chicken salad that is not too mayonnaisey or to put a slice of fresh tomato and melted mozzarella and top it with roasted pepper. Mmmm this was good. I toasted it it for 4 minutes in a toaster and the cheese nicely melted but the bread didn’t burn at all! Just today for dinner my family had turkey tacos with soft taco shells. I actually had my turkey meat with melted cheese wrapped in my flat bread. The bread could totally hold the meat and cheese together. Spices are optional and I highly recommend to add spices and herbs to your liking. For example, combine these herbs and spices into 1 Tablespoon: salt, garlic powder, rosemary, basil, red pepper flakes, thyme and organic coconut palm sugar. You will also need a cooking spray or coconut oil. That’s it. These are the 3 key ingredients. Almond flour, also known as almond meal, is an alternative to wheat flour for baking and cooking. The only ingredients in almond flour are ground, whole blanched almonds with the skin removed. This flour is gluten-free, low in carbohydrates, high in fiber and a high source of protein. In a medium bowl, lightly whisk the egg whites. Then add the almond flour, baking powder, salt, and spices and whisk until there are no lumps. Spray the skillet pan with coconut oil (or add some coconut oil). Heat the skillet pan on medium-high heat until it is fully heated. Then lower to low-medium heat. Scoop about 1/2 cup of the batter onto the pan and cover with lid. After about 2 minutes you will notice that the bread become airy and bubbly. Remove lid and flip the bread. Cook for about another minute. Once you add the batter to the pan, you can sprinkle it with additional spices. This recipe makes about 8 pieces of flat bread. 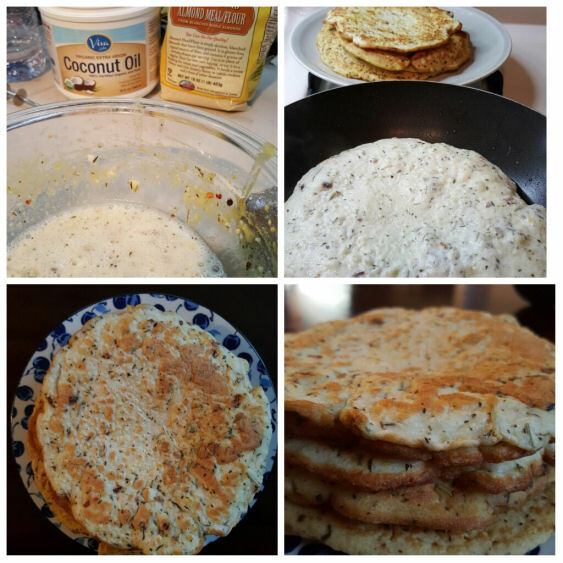 If you have a nut allergy, there’s a way to make this flat bread using a coconut flour, You will get a crepe-like look or tortilla-like look. It also holds the topping VERY well. Enjoy them as soon as they are cool. You can even toast them. Store them on the counter-top for up to 3 days or use them within a week for best results (refrigerated). Spices are optional and I highly recommend to add spices and herbs to your liking. For example, combine these herbs and spices into 1 tsp: salt, garlic powder, rosemary, basil, red pepper flakes, thyme and organic coconut palm sugar. You will also need a cooking spray or coconut oil. Spray the pan with coconut oil (or add some coconut oil). Scoop about ½ cup of the batter onto the pan and cover with lid. After about 2 minutes you will notice that the bread become airy and bubbly. Remove lid and flip the bread. Cook for about another minute. « Healthy Chicken Salad that is not very Mayonnaisey Best served on a #CloudBread of course! 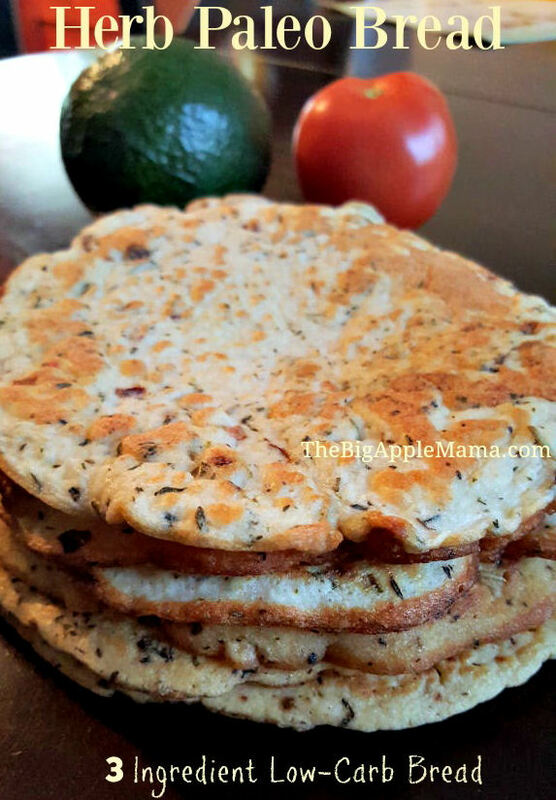 Your 3 Ingredient Paleo flatbread looks interesting, but you do not detail the cooking method. Am I correct in assuming this is in a skillet? What temperature…low heat, medium heat, or what? OMG, I want that. Please come over and teach me! Oh please, my friend. It is very easy! Come over and I will teach you! I am definitely making this!! I am still on cloud nine after making your cloud bread recipe. I will try any recipe you create, they are all amazing! You must do this asap, Irina! It’s super interesting that I used a cup and a half of almond flour and it did not yeild more bread…. :/ It IS really delicious though. Light and fluffy and although the cloud bread is ALSO delicious, this one is non-dairy for kosher meals. I have a feeling you could use a few less egg whites and the bread will still be light… Ill try it next time. Thanks for the recipe – Its a keeper! HI Rebecca.. hmmm… interesting… I would imagine it would yeild more breads… I got to try it and play around… Thank you… Glad you’re enjoying it. I actually made these today…so satisfying, light and fluffy. I agree with you – It’s a keeper! HI Shelcey. I haven’t personally froze the flatbreads. But I think you should try. Once you ready to take them out, I suggest you toast them for 1 minute or heat them up in the oven to start. Let me know if you tried and if this worked? Can you use egg whites from a carton? HI Tina, I have not used egg whites from a carton. I used fresh eggs. Would you give it a try and let me know if the breads came out good and how you liked them? 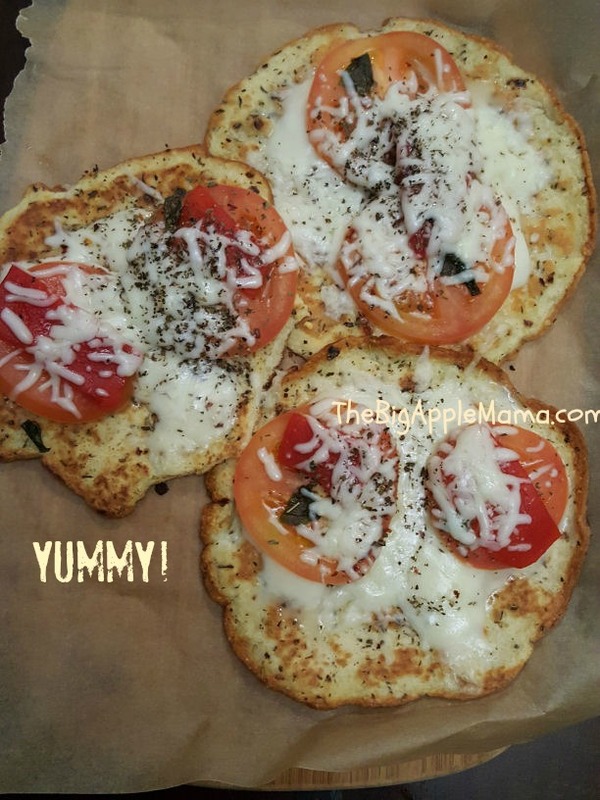 excited to try flat bread recipe ???? size of skillet you use Thank you!!! Could this be baked in the oven instead of pan fried? Irina, thank you for the healthy recipes. I have only tried thus far the cloud bread which is delicious for my Diabetes 1 great grandson. May we have the nutrition count for the flatbread please. Thank you. HI Gilda. This recipe makes 6 breads. It’s about 67 cal per bread and about 2,5g carb, 7g of protein . I hope this is useful.. Thank you Irina. I will try it and I am sure it will be delicious. what consistency should the egg whites be? Should they be forming stiff peaks like with cloud bread? I just made a turkey wrap with this recipe. Absolutely delicious ! Tried the recipe, looked great! Mine turned out more like a thin omelet though, not much of a consistency. I’ll save them to make something like a turkey/cheese wrap.